November 8-10, it's Autumn Art Studios Tour time in Placer County. This year I'll be seeing visitors in my home again. I may finish a couple of additional pieces in time but will try to hold off posting them until after the Tour. So much to do, so little uninterrupted time. 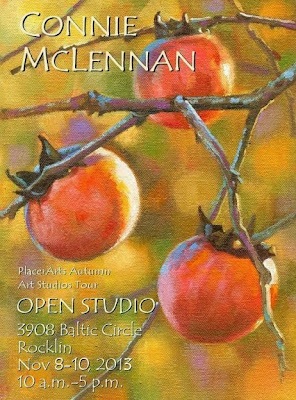 With the Salinas Valley gallery needing new work every other month, the 2014 Art Studio Trek right around the corner, and the ongoing opportunities on Daily Paintworks, it's time to get moving again in earnest, or I might as well find a new line of work.